Breaking continuous flash suppression: a new measure of unconscious processing during interocular suppression? Until recently, it has been thought that under interocular suppression high-level visual processing is strongly inhibited if not abolished. With the development of continuous flash suppression (CFS), a variant of binocular rivalry, this notion has now been challenged by a number of reports showing that even high-level aspects of visual stimuli, such as familiarity, affect the time stimuli need to overcome CFS and emerge into awareness. In this “breaking continuous flash suppression” (b-CFS) paradigm, differential unconscious processing during suppression is inferred when (a) speeded detection responses to initially invisible stimuli differ, and (b) no comparable differences are found in non-rivalrous control conditions supposed to measure non-specific threshold differences between stimuli. The aim of the present study was to critically evaluate these assumptions. In six experiments we compared the detection of upright and inverted faces. We found that not only under CFS, but also in control conditions upright faces were detected faster and more accurately than inverted faces, although the effect was larger during CFS. However, reaction time (RT) distributions indicated critical differences between the CFS and the control condition. When RT distributions were matched, similar effect sizes were obtained in both conditions. Moreover, subjective ratings revealed that CFS and control conditions are not perceptually comparable. These findings cast doubt on the usefulness of non-rivalrous control conditions to rule out non-specific threshold differences as a cause of shorter detection latencies during CFS. Thus, at least in its present form, the b-CFS paradigm cannot provide unequivocal evidence for unconscious processing under interocular suppression. Nevertheless, our findings also demonstrate that the b-CFS paradigm can be fruitfully applied as a highly sensitive device to probe differences between stimuli in their potency to gain access to awareness. The degree to which stimuli are processed without conscious awareness is of fundamental importance to our understanding of the visual system. An answer to this question requires both a psychophysical method to render stimuli invisible and a measure sensitive to unconscious processing. Binocular rivalry (BR) offers a particularly elegant way to erase a visual stimulus from awareness, because during BR perception spontaneously fluctuates between two dissimilar images presented concurrently to the two eyes (e.g., Kim and Blake, 2005; Tong et al., 2006; Sterzer et al., 2009b). Recently, Jiang et al. (2007) introduced a promising new method aimed at uncovering preserved processing of stimuli rendered invisible by such interocular suppression. A rapidly growing number of studies applying this “breaking continuous flash suppression” (b-CFS) technique now suggest that many high-level stimulus properties can be processed without visual awareness, something traditionally thought not to be possible under interocular suppression. The b-CFS method uses a direct measure of conscious perception to infer unconscious processing, namely the time it takes a stimulus to be detected. In the majority of studies on unconscious visual processing, a direct measure of conscious awareness of a stimulus (e.g., detection performance) is compared to an indirect measure of unconscious processing of the same stimulus (e.g., priming effect). Unconscious processing is commonly inferred when the indirect measure exhibits some sensitivity to the same stimulus information to which the direct measure is insensitive. Applying this dissociation logic (Erdelyi, 1986), many studies found that basic stimulus properties such as orientation, spatial frequency, color, or translational motion are still encoded when rendered invisible by interocular suppression (for a comprehensive review, see Lin and He, 2009). While such low-level stimulus properties can be processed unconsciously during suppression, it has remained unclear to what extent higher-level aspects of visual stimuli, such as familiarity or category membership, can be extracted without awareness under such viewing conditions. Evidence from indirect measures such as priming effects or high-level aftereffects suggests that only certain stimulus attributes related to emotional facial expressions (Adams et al., 2010; Yang et al., 2011; but see Yang et al., 2010), highly arousing stimuli (Jiang et al., 2006; Yan et al., 2009), manipulable objects (Almeida et al., 2008, 2010; also see Roseboom and Arnold, 2011), and numerical information (Bahrami et al., 2010) can escape suppression and transpire in subcortical areas (Pasley et al., 2004; Williams et al., 2004; Jiang and He, 2006) and along the dorsal cortical pathway (Fang and He, 2005; but see Hesselmann and Malach, 2011), respectively. By contrast, priming effects triggered by stimuli known to be processed in ventral cortical areas, such as words (Zimba and Blake, 1983), line drawings of objects (Cave et al., 1998), and images of vehicles and animals (Almeida et al., 2008, 2010) are eliminated by interocular suppression. Similarly, invisible faces fail to induce facial identity, gender, race, and face shape aftereffects (Moradi et al., 2005; Amihai et al., 2011; Stein and Sterzer, 2011). These psychophysical findings dovetail with neural responses in the ventral stream being virtually eliminated under suppression (Sheinberg and Logothetis, 1997; Tong et al., 1998; Pasley et al., 2004; Williams et al., 2004; Fang and He, 2005; Hesselmann and Malach, 2011). Only recently, signatures of preserved processing differences between suppressed faces and houses have been detected in distributed activation patterns in category-selective areas of the ventral stream and in magnetoencephalographic markers related to face processing (Sterzer et al., 2008, 2009a). However, it is currently unknown whether such residual traces of activity can influence overt behavior or whether they are purely “epiphenomenal,” i.e., unrelated to task performance (cf. Williams et al., 2007). All of these studies examined unconscious processing during interocular suppression using some implementation of the dissociation paradigm. While intuitively appealing, it is important to note that the dissociation logic has faced repeated theoretical and methodological challenges. For example, there is little consensus on the nature of a direct measure that validly indexes conscious awareness (Cheesman and Merikle, 1986; Draine and Greenwald, 1998; Seth et al., 2008). Even more, it has been questioned whether it is possible at all to devise a direct measure which is sensitive to all aspects of conscious information that might influence performance on the indirect task (Reingold and Merikle, 1988). Conversely, because objective measures of stimulus awareness such as detectability are (at least partly) mediated by unconscious processes, display parameters that yield chance performance in the direct measure may eliminate not only conscious, but also unconscious information (Merikle and Reingold, 1992). Therefore, the dissociation paradigm may underestimate the extent of unconscious processing. In light of these potential problems, it is important to consider alternative approaches to unconscious processing. A fundamentally different strategy exploits the temporal dynamics of perceptual fluctuations during BR. Research on the influence of higher-level stimulus aspects on the dynamics of BR has a long tradition (for a review of earlier findings, see Walker, 1978). In most of these studies, observers continuously tracked periods of perceptual dominance of the two stimuli presented concurrently to the two eyes. Such measures of subjective dominance have revealed that familiar, meaningful, or emotional stimuli predominate more than do unfamiliar, less meaningful, or non-emotional stimuli (e.g., Engel, 1956; Yu and Blake, 1992; Alpers and Gerdes, 2007). However, with regard to unconscious processing these findings remain inconclusive, as increased predominance could be due to perceptual enhancement during dominance and does not necessarily imply enhanced unconscious processing during suppression. By directly measuring the duration of perceptual suppression for familiar and unfamiliar stimuli, Jiang et al. (2007) broke new grounds in addressing the question of whether high-level stimulus properties can remain effective during interocular suppression. To reliably suppress stimuli at the beginning of a trial, Jiang et al. (2007) made use of continuous flash suppression (CFS), a variant of BR in which dynamic Mondrian-like masks flashed to one eye render stimuli presented to the other eye invisible for extended periods of time (Tsuchiya and Koch, 2005)1. For example, in their first experiment, Jiang et al. (2007) presented an upright or inverted face to one eye, while CFS masks were flashed to the other eye. Observers indicated as fast as possible on which side of fixation any part of the face emerged from suppression. Results revealed a face inversion effect (FIE), i.e., longer response times (RTs) for inverted than for upright faces. Since upright and inverted faces consist of identical features, the FIE was interpreted as reflecting preserved higher-level processing differences under rivalry suppression. Following this interpretation, results from recent studies could be taken as evidence that this breaking continuous flash suppression (b-CFS) paradigm is extremely sensitive to unconscious processes. Suppression durations are not only modulated by face inversion (Jiang et al., 2007; Zhou et al., 2010a) or word familiarity (Jiang et al., 2007), but also by emotional facial expressions (Yang et al., 2007; Tsuchiya et al., 2009; Sterzer et al., 2011), eye gaze (Stein et al., 2011), emotional words (Yang and Yeh, 2011), semantic priming (Costello et al., 2009), natural scene content (Mudrik et al., 2011), and even by concurrently presented odors (Zhou et al., 2010b). Clearly, these b-CFS findings challenge the previous notion that higher-level influences on the dynamics of BR are restricted to dominance periods alone (Blake and Logothetis, 2002). Most b-CFS studies have attributed differences in suppression durations to differential unconscious processing during rivalry suppression, i.e., to CFS-specific unconscious processing differences. CFS-specific unconscious processing means that unconscious processing is present because CFS is applied to selectively interrupt conscious processing while leaving some unconscious processing intact. However, shorter suppression durations, for example for more familiar stimuli, could also be caused by generally lower thresholds for conscious detection independent of CFS-specific unconscious processing. Under normal viewing conditions the threshold for conscious detection is determined primarily by the speed of visual processing, which is typically very fast, but slowed under difficult viewing conditions, for example in cluttered displays. To isolate the effect of CFS-specific unconscious processing it is necessary to exclude such non-specific threshold differences as a cause for differences in suppression durations. In addition, because b-CFS studies used RTs to record suppression durations, variable response criteria could also distort the results, especially in states of partial awareness around threshold. Jiang et al. (2007) were aware of these alternative explanations and designed a non-rivalrous binocular control condition intended to perceptually resemble the CFS condition, assuming that non-specific threshold differences should equally unfold in this control condition (Figure 1). In the control condition, participants detected the same stimuli as in the CFS condition, but no interocular suppression was induced as the stimuli were gradually blended in binocularly on top of the CFS masks (see Figure 2). Following the logic of comparing the CFS condition to such a control condition, the absence of RT differences in the control condition would imply that only CFS-specific unconscious processing differences could have caused RT differences in the CFS condition. Thus, the interpretation of any b-CFS study depends critically on the outcome of the control condition (Figure 1). To illustrate, in Experiment 1 by Jiang et al. (2007), no FIE was found in the control condition. This was interpreted as demonstrating that the FIE in the CFS condition could not have been due to a non-specific detection advantage for upright faces, but was caused by CFS-specific unconscious processing differences. Had the control condition yielded an FIE of comparable size, the conclusion would have been that both the CFS and the control condition reflect a detection advantage for upright relative to inverted faces. Figure 1. Flowchart illustrating the logic underlying the b-CFS paradigm. 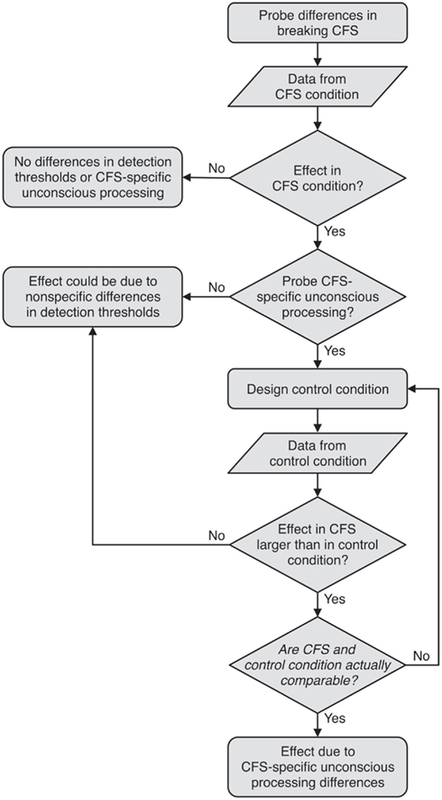 If no control condition is included, no conclusions about CFS-specific unconscious processing differences can be drawn, as the effect obtained under CFS could be due to non-specific differences in detection thresholds. From the comparison of the effect obtained under CFS to the effect obtained in the control condition, CFS-specific unconscious processing can only be inferred if (a) the effect in the CFS condition is larger than the effect in the control condition, and, critically, (b) the CFS and the control condition are actually comparable in the sense that the control condition emulates all processes that are not CFS-specific, but were involved in mediating a difference in stimulus detection in the CFS condition. Figure 2. Schematics of example trials from (A) the CFS condition and (B) the control condition in Experiments 1–3. (A) In the CFS condition, high-contrast Mondrian-like masks flashing at 10 Hz were presented to one eye, while a face stimulus was gradually introduced to the other eye. (B) In the control condition, the masks and the face stimulus were presented binocularly and the face was blended in transparently on top of the masks. In Experiments 1 and 2, participants were asked to indicate as fast and accurately as possible on which side of fixation the face or any part of the face became visible. In Experiment 3, presentation durations were fixed and subjects were required to indicate as accurately as possible, without speed pressure, on which side of fixation the face was shown. Taken together, the b-CFS paradigm represents a fundamentally new approach to the measure of unconscious processing. Unlike the classic dissociation paradigm, the b-CFS paradigm does not compare a direct measure of conscious perception to an indirect measure of unconscious processing. Instead, two direct measures of differences in detection performance are compared, obtained during CFS and during a binocular control condition, to draw conclusions about CFS-specific unconscious processing. If an effect is observed in the CFS condition only, this is attributed to CFS-specific unconscious processing. For this reasoning to be valid, the logic behind b-CFS presupposes that the control condition captures or “emulates” all processes that are not CFS-specific, but were involved in mediating a difference in stimulus detection in the CFS condition (Figure 1). In light of the importance of the control condition for interpreting b-CFS results, it is of note that all previous b-CFS studies demonstrated a null effect in this control condition (Jiang et al., 2007; Costello et al., 2009; Zhou et al., 2010a; Mudrik et al., 2011; Stein et al., 2011; Yang and Yeh, 2011). We found the consistently observed absence of RT differences in the control condition surprising, as most b-CFS studies compared suppression durations for stimuli (e.g., upright vs. inverted faces, fearful vs. neutral faces, emotional vs. non-emotional words, or direct vs. averted gaze) that have frequently been found to differ in their detectability in a range of paradigms not involving BR, such as visual search, backward masking, or the attentional blink. We focused on the advantage of upright over inverted faces in overcoming CFS as an exemplary and consistent b-CFS finding (Jiang et al., 2007; Yang et al., 2007; Zhou et al., 2010a; Stein et al., 2011). The absence of an FIE in the control condition (Jiang et al., 2007; Zhou et al., 2010a) appears at odds with the well-established presence of an FIE in a variety of other detection paradigms under normal binocular viewing conditions (Purcell and Stewart, 1988; Aguirre et al., 1999; Lewis and Edmonds, 2003, 2005; Rousselet et al., 2003; Latinus and Taylor, 2006; Tyler and Chen, 2006; VanRullen, 2006; Chen et al., 2008; Garrido et al., 2008; for a review, see Lewis and Ellis, 2003). Intrigued by this discrepancy, we started off trying to replicate the results reported in the seminal b-CFS study by Jiang et al. (2007). Building up on this, we carried out a series of additional experiments intended to test the validity of the b-CFS paradigm. In particular, we examined whether the comparison between the CFS and the control condition can indeed be relied upon to isolate CFS-specific unconscious processing. We use face inversion only as an example, but the conclusions we draw are relevant for and extend to all applications of the b-CFS paradigm. In Experiment 1, we set out to replicate the results obtained by Jiang et al. (2007). Accordingly, visual stimuli, stimulus size, and experimental setup of Experiment 1 followed the description of their research. To increase sensitivity for detecting an FIE in the control condition we examined a larger sample of subjects and tested all participants both in the CFS and in the control condition. We expected upright faces to be detected faster than inverted faces. The critical question was whether this FIE would be restricted to the CFS condition, as reported by Jiang et al. (2007), or whether an FIE would also be present in the control condition. In addition, we asked whether both conditions were actually comparable in the sense that the control condition emulated all critical factors that could have contributed to a detection advantage for upright faces in the CFS condition. As a first approach to this question, we explored differences between the RT distributions from the two conditions. Most RT analyses, including all previous b-CFS studies, evaluate a measure of central tendency of the RT distribution only, such as mean RT. Following Jiang et al. (2007), we sought to obtain roughly equal mean RTs in the CFS and in the control condition. However, limiting data analysis to a measure of central tendency can conceal important differences between conditions that can only be revealed by an analysis of the full RT distribution (e.g., Ratcliff, 1979; Hockley, 1984; Heathcote et al., 1991). Twenty-four observers (15 female, mean age 28.7 years) participated in Experiment 1. In all experiments, participants were paid, had normal or corrected-to-normal vision and were naïve to the purpose of the study. The study was approved by the Charité ethics committee and informed consent was obtained from all participants. In Experiment 1 and in all further experiments, visual displays were presented on a 19-in Samsung CRT monitor (1024 × 768 pixels resolution, 60 Hz frame rate). Observers viewed a pair of dichoptic displays through a custom-built mirror stereoscope, with the subjects’ heads stabilized by a chin-and-head rest. The effective viewing distance was 50 cm. To promote stable binocular alignment, the mirrors were adjusted for each observer. Visual stimuli were presented with Matlab (The MathWorks, Natick, MA, USA), using the Cogent 2000 toolbox (www.vislab.ucl.ak.uk/cogent.php). Stimuli were displayed against a gray background. During the whole experiment two black frames (10.9° × 10.9°) were presented side by side on the screen, such that one frame was visible to each eye. In the center of each frame a black central fixation cross (0.7° × 0.7°) was displayed. Observers were asked to maintain stable fixation throughout each experimental block. In all experiments, face stimuli were 10 photographs (five female, 2.1° × 2.6°) and their vertical inversions derived from the NimStim face stimulus set (Tottenham et al., 2009). Each trial started with a 1-s presentation of the fixation cross and the black frame only. 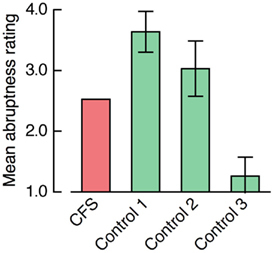 In the CFS condition, colored high-contrast Mondrian-like CFS masks (similar to those used by Jiang et al., 2007; cf. Sterzer et al., 2008, 2009a) measuring 10° × 10° were flashed to one eye at a frequency of 10 Hz, while a face stimulus was introduced to the other eye (see Figure 2). The face was presented either to the left or to the right of the fixation cross, at a random location within the area corresponding to the location of the CFS masks. The contrast of the face stimulus was ramped up linearly from 0 to 100% (i.e., to its original contrast) within a period of 1 s from the beginning of the trial and then remained constant until the participant had made a response. In the control condition, CFS masks and face stimuli were presented binocularly. Face stimuli were gradually blended into the masks by reducing their transparency linearly from 100 to 0% within a period of 2.5 s from the trial’s beginning. We informed participants that both upright and inverted faces would be presented and asked them to press the left or the right arrow key on the keyboard to indicate as fast and accurately as possible on which side of fixation a face or any part of it appeared2. Observers viewed one block containing 120 CFS trials and one block of 120 control trials. Within each block all possible combinations of face orientation (upright, inverted), two eyes for face presentation (only for the CFS condition, in the control condition face stimuli were always presented binocularly) and ten face exemplars were presented equally often and trial order was randomized. Block order was counterbalanced across participants. Trials with erroneous responses or RTs longer than 10 s were discarded (cf. Jiang et al., 2007). In total, less than 2% of all trials for each subject were excluded from the analysis. Mean RTs were analyzed by a repeated measures ANOVA with the factors condition (CFS, control) and face orientation (upright, inverted). There was a trend for a main effect of condition, F(1, 23) = 3.50, p = 0.074, and a significant main effect of face orientation, F(1, 23) = 27.49, p < 0.001, which was qualified by a significant interaction between condition and face orientation, F(1, 23) = 13.13, p = 0.001, indicating a larger FIE in the CFS than in the control condition (see Figure 3A). Importantly, however, the FIE was not only significant in the CFS condition, t(23) = 4.53, p < 0.001, but also in the control condition, t(23) = 4.33, p < 0.001. Figure 3. (A) Mean RTs from Experiment 1. In this and all further graphs depicting mean RTs, positive and negative error bars represent 95% confidence intervals for the paired comparison between upright and inverted faces within each condition. (B) Mean coefficients of variation (CV; SD divided by the mean) from Experiment 1. In this and all further graphs depicting CVs, positive and negative error bars denote 95% confidence intervals for the paired comparison between the CFS and the control condition. The reliable FIE in the control condition indicates that different detection thresholds or criteria for upright and inverted faces that are not specific to CFS do exist in the b-CFS paradigm. Still, the FIE was larger in the CFS condition. One possibility is that this increase in FIE size reflected CFS-specific unconscious processing differences between upright and inverted faces. Alternatively, there might have been other factors that differed between the CFS and the control condition and that could have caused the increased FIE in the CFS condition. Kolmogorov–Smirnov tests (KS-tests) demonstrated significant differences between the RT distributions from the CFS and the control condition for each individual subject (all ps < 0.001). To visualize these differences in the shape of RT distributions, we plotted group cumulative RT distributions comparing the two conditions (Figure 4A). For each subject and each condition, we computed the RTs corresponding to the 5th to 95th percentiles at 5% intervals which were then averaged across subjects. This method preserves the shape of the individual RT distributions (e.g., Thomas and Ross, 1980; Mordkoff and Yantis, 1991). Figure 4A shows that the CFS distribution had more spread and a considerably longer right tail, reflecting increased RT variability and a larger number of trials with particularly long RTs. This enhanced RT variability was also reflected in a significantly larger mean coefficient of variation (CV, SD divided by the mean) in the CFS condition compared to the control condition, t(23) = 13.88, p < 0.001 (Figure 3B). Figure 4. (A) Cumulative group distributions of RTs from the CFS and the control condition in Experiment 1. We obtained the RTs corresponding to the 5th to 95th percentiles at 5% intervals from each subject’s individual cumulative RT distributions. These percentile estimates were then averaged across subjects to create group average RT distributions (Thomas and Ross, 1980; Mordkoff and Yantis, 1991). In this and all further graphs depicting cumulative group distributions, the shaded areas represent 95% confidence intervals generated by bootstrapping (Mack et al., 2009). (B,C) Size of the FIE as a function of percentiles, plotted separately for the (B) CFS and the (C) control condition. Within each condition, we first created separate group average RT distributions for trials with upright and inverted faces and then computed the FIE (RT inverted–RT upright) at each percentile. In this and all further graphs depicting the FIE at separate percentiles, the shaded areas depict the 95% confidence intervals for the FIE at each percentile. To examine which aspects of the distributions were influenced by face inversion and whether face inversion affected the CFS and the control distributions differently, we again used the percentile averaging method to compare RTs to upright and inverted faces at each of the 5th to 95th percentile (spaced at 5% intervals; Figures 4A,C). Over the bulk of the distributions from both conditions, RTs were shorter for upright faces. However, in the control condition the FIE had a similar size across the full distribution (Figure 4C). By contrast, in the CFS condition, the size of the FIE increased toward the right tail of the distribution (Figure 4B). Correspondingly, linear regression analyses demonstrated that the slope for the CFS condition was significantly more positive than for the control condition, F(1, 34) = 44.73, p < 0.001. Thus, trials with exceptionally long RTs (which were virtually absent in the control condition, see Figure 4A) strongly contributed to the increased FIE in the CFS condition. Although differences in RT distributions cannot unequivocally be related to specific underlying perceptual or cognitive processes, it is widely accepted that differences in distributional parameters other than the mean can reflect important differences between experimental conditions (e.g., Luce, 1986; Heathcote et al., 1991). Thus, the striking differences in distribution shape may indicate that the control condition failed to emulate all perceptual and cognitive factors (other than CFS-specific unconscious processing) that were involved in the CFS condition. If true, it would be problematic to rely on the results from the control condition to draw conclusions about the processes underlying the effects obtained in the CFS condition. The most prominent difference between both conditions was the greatly increased RT variability in the CFS condition. One possibility is that this increased RT variability was driven by stochastic variations in the dynamics of BR (e.g., Levelt, 1965; Fox and Herrmann, 1967; Kim et al., 2006). This variability in perceptual dominance of the face stimulus would inevitably introduce temporal uncertainty with regard to the time of face appearance during CFS. By contrast, in the control block the appearance of the face could easily be anticipated, since the face stimuli were faded in at a constant rate. One concern is that different uncertainties with regard to face appearance could have led subjects to adopt different strategies for detecting faces in both conditions. Different strategies could then, for example, have shifted response criteria in a way that yielded different FIE sizes. In the following two experiments, we examined whether the increased FIE in the CFS condition resulted from unconscious processing or from other differences between the CFS and the control condition, such as different strategies (Experiment 2) or response criteria (Experiment 3). In Experiment 2, we mixed CFS and control trials within the same blocks, instead of separating them into distinct pure blocks as done in previous b-CFS studies on the FIE (Jiang et al., 2007; Zhou et al., 2010a). This simple change in experimental design was introduced to attenuate any difference in temporal uncertainty regarding face appearance. We were concerned that differences in temporal uncertainty would lead subjects to adopt different strategies in CFS and control blocks. The impact of different strategies associated with different experimental conditions is known to be amplified when experimental conditions are separated into distinct pure blocks, even in simple perceptual tasks (e.g., Sperling and Dosher, 1986; Los, 1996). Therefore, if strategic differences contributed to the difference in FIE size, this influence should be reduced in a mixed design. A new set of 24 observers (20 female, mean age 23.4 years) participated in Experiment 2. Participants completed 320 trials separated by four breaks: each combination of two conditions, two face orientations, two eyes for face presentation, and ten face identities occurred equally often and trial order was randomized. Incorrect trials and RTs longer than 10 s were discarded (less than 2% of all trials for each subject). A repeated measures ANOVA on mean RTs revealed a trend for a main effect of condition, F(1, 23) = 3.92, p = 0.060, and a significant main effect of face orientation, F(1, 23) = 24.98, p < 0.001, with longer RTs for inverted than for upright faces. Crucially, the interaction between condition and face orientation was not significant, F(1, 23) < 1 (Figure 5A). Thus, the FIE was significant both for the CFS condition, t(23) = 2.69, p = 0.013, and for the control condition, t(23) = 3.29, p = 0.003, and the size of the FIE did not differ significantly between both conditions. Figure 5. (A) Mean RTs and (B) mean CVs from Experiment 2. Hence, when CFS and control trials were mixed within the same blocks, both conditions yielded comparable FIE sizes. As the FIE in the CFS condition was not larger than the FIE in a condition intended to control for differences in detection thresholds or criteria for upright and inverted faces, one would have to conclude that in both conditions the FIE was mediated by a non-specific detection advantage for upright faces. Thus, following the logic of the b-CFS paradigm, the results from Experiment 2 provide no evidence for CFS-specific unconscious processing differences between upright and inverted faces. The increased FIE in the control condition was accompanied by a change in the underlying RT distribution that now better approximated the shape of the CFS distribution (Figure 6B). KS-tests showed significant differences (at the 10% level) between both distributions in only nine out of 24 subjects. In comparison to Experiment 1, the control distribution had more spread and a longer right tail and now closely overlapped with the CFS distribution (Figure 6A). While the mean CV was still significantly larger in the CFS condition, t(23) = 6.41, p < 0.001 (Figure 5B), compared to Experiment 1 the difference between the two conditions was much reduced (compare Figure 5B to Figure 3B). Accordingly, a mixed ANOVA with the between subjects factor experiment (1, 2) and condition (CFS, Control) on the mean CVs yielded a significant experiment-by-condition interaction, F(1, 46) = 93.88, p < 0.001. Figure 6. (A) Cumulative group distributions of RTs from the CFS and from the control condition in Experiment 2. (B,C) Size of the FIE as a function of percentiles, plotted separately for the CFS and the control condition. 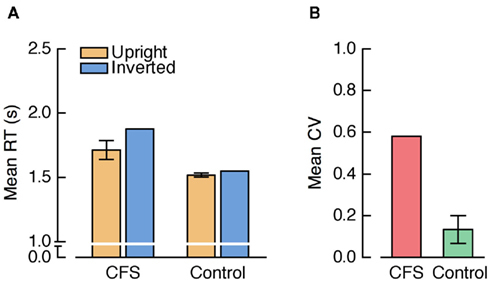 Furthermore, in Experiment 2 face inversion did not only shift the distribution from the control condition rightwards, but also increased the size of its right tail, thereby mimicking the effect of face inversion on the CFS distribution (Figures 6B,C). This impression was supported by linear regression analyses showing that the slopes were positive for both the CFS and the control condition, F(1, 17) = 31.50, p < 0.001, and F(1, 17) = 15.56, p < 0.001, respectively, while – in contrast to Experiment 1 – there was no statistically significant difference between the slopes, F(1, 34) < 1. Thus, both in the CFS and in the control condition the FIE was now particularly pronounced for trials with slow RTs. We had hypothesized that a mixed design would reduce potential differences between conditions with regard to temporal uncertainty or subjects’ strategies. Following this reasoning, the convergence of the distributions may reflect a reduction of factors that differed between the two conditions, such as temporal uncertainty or subjects’ strategies. We would expect uncertainty and strategies to influence primarily (although not exclusively) “postperceptual” factors related to decision making, response selection, or response initiation. Clearly, the choice RT procedure employed in the b-CFS paradigm is susceptible to influences from postperceptual factors, such as different response criteria for upright and inverted faces. It is important to note that the possible impact of such non-perceptual factors may be limited to the comparison of upright and inverted faces and does not necessarily apply to other b-CFS studies using different stimuli. For example, it is difficult to imagine that observers would have different response criteria for images of complex scenes that differed only in their semantic content (Mudrik et al., 2011). By contrast, the greater familiarity of upright faces could be associated with a more liberal response criterion. To test this possibility, in Experiment 3 we again used a mixed design but ruled out the potential influence of differential response criteria. To that end, we fixed display durations and measured response accuracies instead of RTs, using a spatial two-alternative forced-choice (2AFC) task without speed pressure. If the increased FIE in the CFS condition reflected CFS-specific unconscious processing differences while the increased FIE in the mixed design control condition reflected postperceptual factors, in Experiment 3 we would expect a larger FIE in the CFS than in the control condition. Alternatively, if both FIEs were caused by a non-specific detection advantage for upright faces, we would expect FIEs of similar size. Twenty observers (16 female, mean age 27.4 years) participated in Experiment 3. Each trial started with a 1-s presentation of the fixation cross and the black frame only, followed by the face stimulus and the CFS masks displayed for 500, 700, 1000, or 1500 ms. In the CFS condition face contrast reached 50% in 500-ms displays, 70% in 700-ms displays, and 100% in 1000 and 1500-ms displays. In the control condition, face transparency was 80% in 500-ms displays, 72% in 700-ms displays, 60% in 1000-ms displays, and 40% in 1500-ms displays. In both conditions, face stimulus presentation was followed by three trailing masks, each presented for 100 ms binocularly to prevent afterimages. At the end of the stimulus sequence, observers were prompted to press the left or the right arrow key on the keyboard to indicate as accurately as possible on which side of fixation the face image had been shown. No feedback was given. Participants were encouraged to take as much time as they needed to make their responses. Instructions informed observers that upright and inverted faces would be presented during each trial and that in some trials only parts of the faces might become visible. All participants were tested in two sessions separated by 1–3 days. A single session consisted of 640 trials separated by nine breaks. Within a session each combination of two conditions, two face orientations, two eyes for face presentation, four presentation durations, and ten face exemplars occurred with equal probability and trial order was randomized. Proportions of correct responses were analyzed by a repeated measures ANOVA with the factors condition, face orientation, and presentation duration (500, 700, 1000, 1500 ms). Face detection accuracy increased with longer presentation durations, F(3, 57) = 193.64, p < 0.001. More importantly, there was a significant main effect of face orientation, F(1, 19) = 11.33, p = 0.003, with higher accuracy for upright faces than for inverted faces (see Figure 7). Neither the main effect of condition, F(1, 19) = 1.37, p = 0.257, nor the interaction between condition and presentation duration, F(3, 57) = 1.59, p = 0.202, were significant. Crucially, no other interaction, including the condition-by-face orientation interaction, approached significance, all Fs < 1. Figure 7. Results from Experiment 3. Mean accuracies for upright and inverted faces, presented separately for (A) the CFS condition and (B) the control condition at each presentation duration. 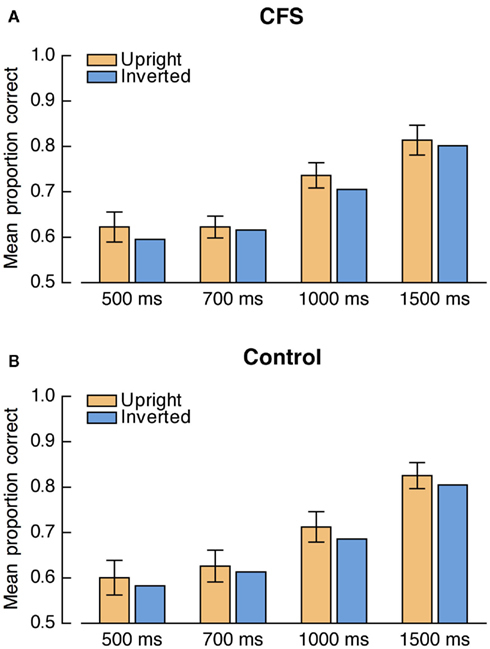 Error bars denote the 95% confidence interval for the paired comparison of upright and inverted faces at the respective presentation duration. Thus, when the putative influence of differential response criteria was eliminated we found a detection advantage for upright faces that was independent of condition. Accordingly, the FIE in the control condition reflected a lower detection threshold for upright faces and cannot be ascribed simply to the influence of differential response criteria or to other postperceptual factors. 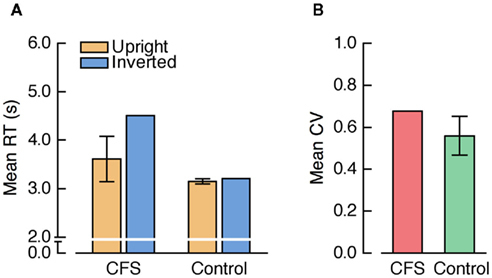 As the FIE was not enlarged in the CFS condition, the results from Experiment 3 suggest that shorter suppression durations for upright faces reflected the same non-specific detection advantage in both conditions and thus, consistent with the results of Experiment 2, fail to provide evidence for CFS-specific unconscious processing differences between upright and inverted faces. In summary, the results from Experiments 1–3 demonstrate a detection advantage for upright faces that is not specific to CFS. In all three experiments we found an upright face advantage in the control condition. Still, in Experiment 1 the FIE in the control condition was smaller than the FIE in the CFS condition, allowing the possibility that CFS-specific unconscious processing could have contributed to the increased FIE. However, when CFS and control trials were mixed within the same block (Experiment 2) and when we measured detection accuracies instead of RTs (Experiment 3), the FIE was similarly large in both conditions. Thus, to account for different suppression durations in these experiments, it suffices to assume non-specific detection differences for upright and inverted faces, and it is not necessary to postulate CFS-specific unconscious processing differences. Taking the results of the previous experiments together, we found no evidence for additional CFS-specific unconscious processing under b-CFS compared to the control condition when RT distributions of both conditions were matched (Experiment 2) and when we controlled for effects of response criteria by using a 2AFC task (Experiment 3). Before throwing the baby out with the bathwater, we were interested whether it might nevertheless be possible to find evidence for CFS-specific unconscious processing. The previous experiments were designed to closely resemble the experimental protocol and visual displays employed by Jiang et al. (2007) and to yield similar overall suppression durations as previous b-CFS studies on the FIE (Jiang et al., 2007; Zhou et al., 2010a). Still, it is possible that CFS-specific unconscious effects are indeed present, but cannot be increased beyond the size of non-specific effects with such short suppression durations. As results from other studies conducted in our laboratory (e.g., Stein et al., 2011) indicated that longer overall suppression durations might yield larger effects in the CFS condition, in the following experiments we adjusted the display parameters to induce longer periods of perceptual suppression. We asked whether longer suppression durations would result in a larger FIE and whether this FIE would be larger than the effect obtained in the control condition, despite the use of a mixed design. Furthermore, these additional experiments allowed us to test whether mixing the CFS and the control condition would invariantly result in similar RT distributions for both conditions, as suggested by Experiment 2. In addition to the comparison of RT distributions, in Experiment 4 we tested whether the control condition actually mimicked the perceptual experience during CFS, as assumed by all previous b-CFS studies that relied on the comparison with a control condition to infer CFS-specific unconscious processing. To that end, we had participants judge their subjective impression of face appearance after each trial. Fourteen observers (nine female, mean age 24.5 years) participated in Experiment 4. For Experiments 4 (as well as for Experiments 5 and 6), the visual displays were slightly modified (Figure 8). To further facilitate stable binocular fusion, fusion contours (width 0.5°) consisting of randomly arranged black and white pixels were drawn within the frames (10.9° × 10.9°) presented to each eye. In order to induce longer periods of perceptual suppression, we generated another variant of Mondrian-like CFS masks (10.4° × 10.4°) consisting of colored, randomly arranged circles (diameter 0.4°–1.8°; similar to the masks used by Tsuchiya et al., 2009). During pilot testing, these masks suppressed stimuli for longer periods than those employed in the previous experiments. Figure 8. Schematics of example trials from (A) the CFS condition and (B) the control condition in Experiments 4–6 in which we employed a new set of masks that induced longer periods of perceptual suppression in the CFS condition. In Experiments 4 and 5, we used a speeded localization task as in Experiments 1 and 2. In Experiment 6, display presentation durations were fixed and the localization task was unspeeded, as in Experiment 3. The face stimuli were always centered at a horizontal distance of 3.9° either to the left or to the right of the fixation cross, at a random vertical position relative to the fixation cross (maximum vertical center-to-center distance 2.9°). We now included three different control conditions that differed with regard to the length of the transparency ramp. In the 8.5-s ramp control condition, face transparency was reduced from 100 to 0% within 8.5 s. In the 2.5-s ramp control condition, this transparency ramp lasted 2.5 s. Finally, we also included a no-ramp control condition in which the face was displayed binocularly at full contrast at a randomly selected time point (0.5, 1.0, 2.0, 3.5, or 5.0 s after trial onset; cf. Sterzer et al., 2011). As in Experiments 1 and 2, participants’ primary task was to indicate as fast and as accurately as possible the side of fixation on which the face stimulus or any part of the face appeared, using the left or the right arrow key on the keyboard. In addition, participants judged their subjective impression of face appearance at the end of each trial. After indicating face location, participants were prompted to judge how abrupt the face had appeared by pressing a key from 1 to 4, with 1 meaning abrupt and 4 meaning gradual face appearance. Instructions emphasized that this “abruptness rating” represented a secondary task and that localization responses should under no circumstances be decelerated or withheld in order to better judge the abruptness of face appearance. Participants were encouraged to follow their spontaneous impressions when judging abruptness and to guess if necessary. Experiment 4 consisted of 320 trials (separated by three breaks). Each combination of four conditions (CFS, three control conditions), two face orientations, two eyes for face presentation, and ten face exemplars was presented equally often and trial order was randomized. Trials with incorrect responses (less than 4% of all trials for each subject) and CFS trials with RTs longer than 15 s (compared to Experiments 1 and 2 we extended the cut-off by 5 s to account for the prolonged overall suppression durations) as well as CFS trials in which the face went undetected (13.8%) were discarded. Overall, 95.5% of all trials were included in the analyses. A repeated measures ANOVA on mean RTs with the factors condition (CFS, three control conditions) and face orientation yielded a significant main effect of condition, F(3, 39) = 41.80, p < 0.001, a significant main effect of face orientation, F(1, 13) = 19.78, p < 0.001, and, importantly, a significant interaction between condition and face orientation, F(3, 39) = 13.94, p < 0.001. The FIE was significant in the CFS condition, t(13) = 4.01, p = 0.001, and in the 8.5-s ramp control condition, t(13) = 2.46, p = 0.029, but neither in the 2.5-s ramp control condition nor in the no-ramp control condition, both t(13) < 1 (see Figure 9A). Crucially, the FIE was significantly larger in the CFS condition than in the 8.5-s ramp control condition, F(1, 13) = 14.18, p = 0.002. Figure 9. (A) Mean RTs and (B) mean CVs from Experiment 4. “Control 1” refers to the 8.5-s ramp, “Control 2” refers to the 2.5-s ramp, and “Control 3” refers to the no-ramp control condition. Thus, longer overall suppression duration resulted in a larger FIE compared to the CFS conditions in the previous experiments (compare Figure 9A to Figures 3A and 5A) and this FIE exceeded the effect obtained in the control condition, despite the use of a mixed design. According to the b-CFS logic, the increased FIE in the CFS condition in Experiment 4 would provide evidence for CFS-specific unconscious processing differences between upright and inverted faces, contrary to the results of Experiments 2 and 3. We next tested whether the mixed design used in Experiment 4 attenuated differences between the RT distributions from the CFS and the control condition, as in Experiment 2, or whether the increased FIE in the CFS condition was accompanied by marked differences between the RT distributions from both conditions, as in the blocked design in Experiment 1. KS-tests yielded significant differences between the CFS distribution and the 8.5-s ramp control distribution for each individual subject (all p < 0.01). As in Experiment 1, the CFS distribution had more spread and a longer right tail (Figure 10A), the mean CV was greatly enhanced in the CFS condition, t(13) = 11.99, p < 0.001 (Figure 9B), and the effect of face inversion strongly increased toward the right tail of the CFS distribution (compare Figures 10B,C). Figure 10. (A) Cumulative group distributions of RTs from the CFS and from the 8.5-s ramp control condition in Experiment 4. (B,C) Size of the FIE as a function of percentiles, plotted separately for the CFS and the 8.5-s ramp control condition. Thus, using a mixed design as in Experiment 2 is not sufficient to eliminate differences between experimental and control condition in RT distributions. As discussed for Experiment 1, these considerable distributional differences could indicate that the control condition did not reproduce all relevant factors that might have played a role in the CFS condition. The concern that the control condition did not represent a good analog of the CFS condition was borne out by participants’ ratings of subjective face appearance. Mean abruptness ratings significantly differed between the four presentation conditions, F(3, 39) = 104.25, p < 0.001 (see Figure 11). To test whether one of the control conditions yielded a subjective impression of face appearance comparable to the CFS condition, we compared the mean ratings between the CFS condition and the three control conditions. Face appearance in the 8.5-s ramp control condition was judged to be more gradual than in the CFS condition, t(13) = −7.15, p < 0.001. Even the 2.5-s ramp control condition that yielded much shorter overall RTs (see Figure 9) generated a more gradual impression of face appearance than the CFS condition, t(13) = −2.39, p = 0.033. Conversely, face appearance in the no-ramp control condition was rated as being more abrupt than in the CFS condition, t(13) = 8.74, p < 0.001. Figure 11. Rating of subjective face appearance in Experiment 4. Bar plots denote participants’ mean ratings of the abruptness of face appearance (from 1 abrupt to 4 gradual). “Control 1” refers to the 8.5-s ramp, “Control 2” refers to the 2.5-s ramp, and “Control 3” refers to the no-ramp control condition. Positive and negative error bars represent 95% confidence intervals for the paired comparison between the CFS condition and the respective control condition. Thus, none of the control conditions included in Experiment 4 could match the CFS condition in the subjective abruptness of face experience. Progressive fading-in of the face stimulus as in most previous b-CFS studies (Jiang et al., 2007; Costello et al., 2009; Zhou et al., 2010a; Mudrik et al., 2011; Stein et al., 2011; Yang and Yeh, 2011) led to the impression of a more gradual face appearance. Furthermore, the comparison to the no-ramp control condition revealed that breakthrough from suppression was not “all-or-none,” i.e., it was not experienced as the sudden presence of a previously fully absent percept. This may reflect the perception of extended transition periods in which neither the mask nor the face achieved full dominance. Indeed, during conventional BR, observers frequently experience transition periods in which a compound of both stimuli is perceived, either piecemeal or superimposed (e.g., Blake et al., 1992; Yang et al., 1992), and these transition periods can be in the order of seconds (Brascamp et al., 2006). Mimicking the subjective perception during such transition periods in a binocular control condition appears difficult if not impossible (an issue we will return to in the General Discussion). In summary, inducing longer periods of perceptual suppression led to a large FIE in the CFS condition that exceeded the effect obtained in the control condition. We can only speculate about the cause of the apparent relationship between overall suppression durations and FIE size, one possible reason being unconscious processing differences unfolding successively over longer periods of invisibility. However, a caveat to this interpretation is that both the analysis of RT distributions as well as the subjective rating of face appearance revealed marked differences between the CFS and the control condition, as in Experiment 1. Therefore, the comparison of both conditions does not necessarily isolate CFS-specific unconscious processing, but could reflect any other process differentially engaged by the CFS and the control condition. In contrast to Experiment 2, implementing a mixed design did not lead to a convergence of the RT distributions from the two conditions. In Experiment 4, longer overall durations of perceptual suppression resulted in a proportional increase in RT variability, whereas in the transparency ramp control conditions RT variability tended to be even lower than in Experiment 2 (compare Figures 5B and 9B). We had hypothesized that the similarity of RT distributions seen in Experiment 2 could have reflected a reduction of differences between conditions, perhaps related to face predictability, subjects’ strategies or response criteria. Following this reasoning, the divergence of RT distributions in Experiment 4 suggests that a mixed design is not always successful in reducing such differences. We can only speculate about this discrepancy, one possibility being that the overall prolonged duration of the CFS trials in Experiment 4 left sufficient time for subjects to consciously adjust their response strategy. In the final two experiments, we addressed these concerns. In Experiment 5, we again tried to match RT distributions of the CFS and control condition as in Experiment 2 and made face appearance in the control condition less predictable by implementing a wide range of different transparency ramps. In Experiment 6, we used an unspeeded spatial 2AFC task similar to Experiment 3 to rule out the potential impact of different response criteria. A new group of 14 observers (nine female, mean age 25.2 years) participated in Experiment 5. One subject was excluded from the analysis due to data loss (computer error in recording the log file). While the CFS condition was identical to Experiment 4, in the control condition we now implemented a range of different transparency ramps. To increase variability in face appearance, for each subject 40 different ramp durations were randomly drawn from an ex-Gaussian distribution which typically provides an excellent fit to RT data from a wide range of experiments (e.g., Hockley, 1984; Heathcote et al., 1991). The parameters for this ex-Gaussian distribution (μ = 4.9 s, σ = 7.3 s, τ = 12.2 s) were selected based on pilot testing. Ramp durations shorter than 250 ms were set to 250 ms to replace negative values. The 10 face exemplars were then randomly assigned to the 40 different ramps, such that both the upright and the inverted version of a given face exemplar were presented using the same ramp durations. There were 160 trials (separated by one break): each combination of two conditions, two face orientations, two eyes for face presentation, and ten face exemplars occurred equally often and trial order was randomized. Trials with incorrect responses (less than 3% of all trials for each subject) and CFS trials with RTs longer than 15 s as well as CFS trials in which the face went undetected (10.9%) were discarded. In total, 92.3% of all trials were included in the analyses. A repeated measures ANOVA with the factors condition and face orientation yielded a significant main effect of condition, F(1, 12) = 5.93, p = 0.031, with somewhat shorter RTs in the control condition, and a significant main effect of face orientation, F(1, 12) = 20.67, p < 0.001, as well as a significant interaction between condition and face orientation, F(1, 12) = 14.45, p < 0.001. While the FIE was significant not only in the CFS condition, t(12) = 4.91, p = 0.001, but also in the control condition, t(12) = 2.40, p = 0.033, the FIE was again significantly larger in the CFS condition (see Figure 12A). Figure 12. (A) Mean RTs and (B) mean CVs from Experiment 5. Before turning to the comparison of the RT distributions, it should be noted that in contrast to the previous experiments in which stimuli were presented in the same manner in each trial from a given condition, in Experiment 5 RTs in the control condition were artificially spread by the different ramp durations that varied from trial to trial. KS-tests revealed significant differences between the CFS and the control distributions for all but one subject (all p < 0.05). While the implementation of variable ramps increased RT variability in the control condition to a level close to the variability in the CFS condition (Figures 12B and 13A), the mean CV was still significantly larger in the CFS condition, t(12) = 2.75, p = 0.018. Finally, as in the previous experiments the effect of face inversion increased toward the right tail of the CFS distribution, while no clear trend was seen in the control condition (Figures 13B,C). Correspondingly, linear regression analyses revealed that while the slopes were positive for both the CFS, F(1, 17) = 282.70, p < 0.001, and the control condition, F(1, 17) = 15.49, p = 0.001, there was a significant difference between the slopes, F(1, 34) = 81.85, p < 0.001. Figure 13. (A) Cumulative group distributions of RTs from the CFS and from the control condition in Experiment 5. (B,C) Size of the FIE as a function of percentiles, plotted separately for the CFS, and the control condition. In summary, although we failed to fully match both conditions in RT distributions, compared to the previous experiments RT variability was greatly enhanced in the control condition of Experiment 5, thus reducing predictability of face appearance. Nevertheless, the FIE was still considerably larger in the CFS condition, suggesting that stimulus predictability may not be the critical factor underlying the enhanced effect under CFS. Thirteen new participants (eight female, mean age 23.7 years) took part in Experiment 6. In Experiment 6, we fixed presentation durations to measure face localization accuracies using an unspeeded 2AFC task (which was identical to Experiment 3). Apart from this, Experiment 6 was identical to Experiment 4, except that for the control condition we used the settings from the 8.5-s ramp control condition only. In the CFS condition, face stimuli were always presented to the subjects’ dominant eye (to reduce the length of the experiment by shortening overall suppression durations), as determined by the Miles (1930) test. 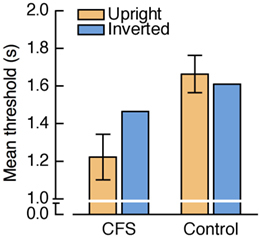 For each of the four conditions (CFS upright, CFS inverted, Control upright, Control inverted) presentation durations were adjusted continuously by adaptive staircases using 1 up 3 down rules with fixed step sizes of 500 ms, with the constraint that presentation duration was not allowed to fall below 500 ms or to exceed 15 s. To prevent afterimages, each face presentation sequence was followed by six trailing CFS masks consisting of slightly smaller and differently colored circles. At the beginning of each session participants completed a short RT block identical to Experiment 4 but containing 24 trials (12 CFS, 12 Control trials) only. The mean RTs (rounded to the next 500 ms) from the CFS and the control condition were then taken as initial values for the CFS and the control staircases, respectively. Participants completed 480 trials (separated by five breaks) in which each combination of two conditions, two face orientations, and ten face exemplars occurred equally often. Trial order was randomized, meaning that the four staircases were randomly interleaved. For each of the four staircases, we determined a threshold estimate by averaging all trials on which a reversal of the presentation duration occurred (other methods for calculating the threshold yielded virtually identical results). One extreme outlying subject (threshold estimates in the CFS condition: 3.48 s for upright faces, 8.66 s for inverted faces) was excluded from the analysis. A repeated measures ANOVA on the threshold estimates revealed a trend toward a significant main effect of condition, F(1, 11) = 4.79, p = 0.051, a significant main effect of face orientation, F(1, 11) = 7.13, p = 0.022, and a significant interaction between condition and face orientation, F(1, 11) = 18.64, p = 0.001. 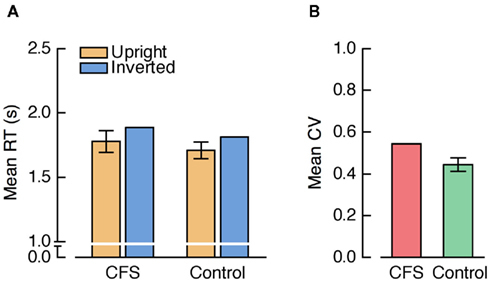 Figure 14 shows that in the CFS condition thresholds were significantly lower for upright than for inverted faces, t(11) = −4.58, p = 0.001, while there was no significant threshold difference in the control condition, t(11) = 1.19, p = 0.260. Figure 14. Results from Experiment 6. Mean threshold estimates for upright and inverted faces. Positive and negative error bars denote the 95% confidence intervals for the paired comparisons between upright and inverted faces within each condition. These results show that the large FIE observed in Experiments 4 and 5 cannot be explained solely by different response criteria for upright and inverted faces. However, in contrast to the previous experiments, in Experiment 6 we for the first time obtained no significant FIE in the control condition. Possibly, the relatively large fixed step size of the staircases was suboptimal for detecting threshold differences in the control condition. For example, it is conceivable that performance at a given presentation duration was at ceiling for both upright and inverted faces (i.e., face transparency was too low), whereas a 500-ms decrement in the presentation duration might have yielded floor effects (i.e., face transparency was too high). In the present study, we evaluated the validity of the b-CFS paradigm for studying unconscious processing during interocular suppression, using the effect of face inversion as an example. Initially invisible upright faces were detected faster under CFS than inverted faces (Experiments 1, 2, 4, and 5), replicating previous reports. Also in accuracy-based measures using unspeeded 2AFC tasks (Experiments 3 and 6) we found an advantage for upright faces in overcoming CFS, meaning that differential response criteria for upright and inverted faces cannot account for the effect. However, detection differences under CFS do not necessarily have to reflect unconscious effects under suppression, or differential CFS-specific unconscious processing, but could also be due to more general differences not specific to the method of CFS (Figure 1). To infer CFS-specific unconscious processing, it is necessary to rely on the comparison of the CFS condition to the results from the binocular control condition which is supposed to index non-specific threshold differences. We found an FIE in the control condition in five out of the six experiments, but in all but one experiment this effect was smaller than in the CFS condition. Assuming that the comparison between detection differences measured in both conditions isolated CFS-specific unconscious processing, the increased FIE under CFS would provide evidence for CFS-specific unconscious processing differences. However, this conclusion depends entirely on the premise that the comparison between the CFS and the control condition does indeed isolate CFS-specific unconscious processing and does not reflect any other factors that might differ between conditions. Are the CFS and the Control Condition Comparable? As no previous b-CFS study actually considered the truth of this premise, here we made a first attempt to explore whether there might be other differences rather than CFS-specific unconscious processing between the CFS and the control condition. In three out of the four RT experiments we found a larger FIE in the CFS condition, but also marked differences between the RT distributions from both conditions, with much greater RT variability and a larger proportion of trials with very long RTs in the CFS condition. Only in Experiment 2 where RT distributions were more comparable, we found an FIE of the same size in both conditions. The distinct characteristics of the CFS and the control distributions may point to differences in the underlying perceptual and cognitive processes, for example reflecting reduced predictability of stimulus appearance and greater uncertainty in the CFS condition. Are we suggesting that we only need (approximately) matched RT distributions in order to draw valid conclusions from the comparison between the CFS and the control condition? Certainly this would not be sufficient. In fact, previous b-CFS studies used the method of blending stimuli binocularly into the CFS masks as the control condition in order to mimic the perceptual experience (cf. Jiang et al., 2007) induced by the CFS condition. However, whether both conditions are indeed perceptually matched or at least perceptually similar had never been tested. The results from Experiment 4 speak against this assumption, revealing that gradual stimulus fade-in is subjectively considerably different than emergence from CFS. It is important to note that this “abruptness rating” measured only one particular aspect of an indefinite number of possible perceptual experiences. Further (unpublished) observations from our laboratory revealed even larger differences in rating scores when subjects were asked to judge their subjective impression of a stimulus feature that physically differed between both condition, such as the faces’ transparency. Ideally, one would want to show that both conditions are matched perceptually in all aspects of perceptual experience, which seems virtually impossible to achieve in practice, given that the factors governing the perceptual differences between both conditions are unknown. A less rigorous but more practical alternative for future b-CFS studies would be to demonstrate that subjects cannot distinguish between the CFS and the control condition, for example using a two-interval forced-choice task, asking subjects which of both instances was the CFS condition. Unfortunately, from our experimental experience it appears difficult if not impossible to design a control condition that mimics the perceptual experience under CFS in the sense that it cannot be discriminated from the b-CFS condition. In particular, it would be very challenging to accurately model the perceptual transitions associated with breakthrough from CFS. To conclude, the present findings of striking differences between CFS and control – not only with respect to FIE, but also regarding a number of other factors – seriously challenge the fundamental premise of the b-CFS paradigm, namely that the two conditions differ only with regard to CFS-specific unconscious processing, and hence cast doubt on the notion that b-CFS can provide unequivocal evidence for CFS-specific unconscious processing. Do Large b-CFS Effects Prove CFS-Specific Unconscious Processing? It should be noted that our concerns relate only to the validity of the conclusions drawn from the b-CFS paradigm, while they do not categorically rule out the possibility that CFS-specific unconscious processing differences did play a role in mediating the advantage of upright faces in overcoming CFS. The size of the FIE varied enormously depending on the strength of suppression induced by the CFS masks, ranging from about 150 ms for short overall suppression durations (Experiments 1 and 2) to more than 850 ms for longer overall periods of suppression, far exceeding the FIE obtained in the control condition (Experiments 4 and 5). On the face of it, it may appear straightforward to explain the sheer size of the difference between the effects in the CFS and the control condition with CFS-specific unconscious processing above and beyond the “normal” stream of visual processing. However, because the CFS and the control condition are not truly comparable, the mere difference in FIE size is not sufficient to infer CFS-specific unconscious processing. From other paradigms, it is well-known that apparently small changes in the experimental protocol or visual displays yield dramatically different effects. For example, the effect of inversion on detecting a face in visual search displays ranges from about 20 ms (Lewis and Edmonds, 2005) to nearly 1000 ms (Garrido et al., 2008), depending on target–distractor similarity. Similarly, large effect size differences between the CFS and the control condition could be due to a variety of differences between the two conditions other than unconscious processing during interocular suppression. To illustrate, consider a control condition in which stimuli at full contrast are popped in on top of the CFS masks at various points in time, as in the no-ramp control condition of Experiment 4. In principle, this could also be considered a condition that controls for non-specific threshold differences between the two conditions (e.g., upright and inverted faces). Yet, most previous b-CFS studies did not implement such a no-ramp control condition, presumably because it is more obvious that this condition does not perceptually resemble the CFS condition and, when comparing RTs to different stimuli, most likely produces floor effects. That being said, we are not aware of any a priori reason to suppose that gradual blending stimuli into the masks would avoid floor effects or constitute a better perceptual analog of the CFS condition. In fact, the rating results from Experiment 4 indicate that both the no-ramp and the transparency ramp control condition fail to mimic the subjective impression of breakthrough from suppression. Thus, just as the transparency ramp control condition is a more sensitive measure of differences in stimulus detectability than the no-ramp control condition (Experiment 4), the CFS condition could be regarded as an even more sensitive measure of non-specific differences in stimulus detectability. We can only speculate about potential reasons for these differences between conditions in their sensitivity to detection threshold differences. Again, the comparison of the no-ramp and the transparency ramp control condition may serve as an illustration. When popping in stimuli on top of the masks, the time window in which sensory evidence is sufficiently weak or ambiguous to allow detection threshold differences between stimuli to unfold is very short. Presumably, transparency ramps were implemented in previous b-CFS control conditions not only in an attempt to perceptually approximate the CFS condition, but also to avoid floor effects by widening this temporal window. However, gradual blending stimuli into the masks also yields only a narrow time window in which the transparency ramp reaches values that are appropriate for measuring threshold differences. While this may explain the weak or even absent effects in the control conditions, an important question for future research will be to pinpoint the perceptual mechanisms underlying the heightened sensitivity of the CFS condition, considering CFS-specific unconscious processing as only one possible explanation. To summarize, our study demonstrates that the b-CFS paradigm in its current form cannot provide unequivocal evidence for unconscious processing during interocular suppression. While our findings do not categorically exclude the possibility that CFS-specific unconscious processing might be involved in mediating breakthrough from suppression, the striking differences between the CFS and the control condition preclude definite conclusions based on the comparison of the two conditions. Although we focused on the effect of face inversion as an example, these concerns equally apply to b-CFS experiments that inferred differential unconscious processing during interocular suppression for other sets of stimuli. As these conclusions rested on the untested (and most likely unwarranted) premise that the CFS and the control condition differed with regard to CFS-specific unconscious processing only, differences between stimuli in overcoming suppression revealed by previous b-CFS studies should be reconsidered, taking into account that non-specific differences in detection thresholds rather than CFS-specific unconscious processing might have caused these effects. Future b-CFS studies aimed at uncovering unconscious processing under interocular suppression should take great care in ensuring that the control condition does indeed represent an appropriate analog of the CFS condition and that the two conditions differ only with regard to CFS-specific unconscious processing. If the CFS and the control condition cannot be matched, one can only speculate about a potential role of CFS-specific unconscious processing, but no definite conclusions can be drawn. However, for researchers primarily interested in measuring differences in the detectability of visual stimuli, regardless of unconscious processing differences specifically tied to interocular suppression, b-CFS clearly is a technique that offers unique sensitivity for measuring detection threshold differences. In the tradition of the New Look school of perception (Bruner, 1957), such threshold differences were considered as a measure of unconscious processing, because faster detection can only happen when the visual system discriminates stimuli before detection, i.e., unconsciously. Recently, this approach has been revived, for example in research on perceptual defense vs. vigilance for emotional words (Dijksterhuis and Aarts, 2003), and has been proposed to have greater sensitivity to unconscious processing than the dissociation paradigm (Gaillard et al., 2006). Applying b-CFS in this way obviates the need for creating a tediously designed control condition (see Figure 1), and equips researchers with a powerful and highly sensitive device to probe potency of visual stimuli to gain access to awareness. This work was supported by the German Research Foundation (Emmy Noether Program, STE-1430/2-1). Timo Stein and Martin N. Hebart were supported by the Studienstiftung des deutschen Volkes. ^In fact, it is not yet clear whether CFS should be regarded as a variant of BR that induces particularly strong suppression (Shimaoka and Kaneko, 2011), or whether CFS is supported by mechanisms distinct from BR (Tsuchiya et al., 2006). For the purpose of the present article, we follow the currently common practice (e.g., Lin and He, 2009) and use CFS and rivalry suppression interchangeably. ^It is possible that this instruction slightly deviated from the study by Jiang et al. (2007) who instructed observers to “respond to the appearance of any part of the test image [emphasis added].” We informed participants about the presentation of faces as test images, because we found it difficult to instruct naïve participants to discriminate a “test image” from the CFS masks without further specifying what that test image distinguishes from the random shapes constituting the mask. Moreover, even when instructed to detect a test image, participants would realize after a few trials that the test image set consisted only of upright and inverted faces. We therefore do not believe that this possible difference to the study by Jiang et al. (2007) could have affected our results. Adams, W. J., Gray, K. L. H., Garner, M., and Graf, E. W. (2010). High-level face adaptation without awareness. Psychol. Sci. 21, 205–210. Aguirre, G. K., Singh, R., and D’Esposito, M. (1999). Stimulus inversion and the response of face and object-sensitive cortical areas. Neuroreport 10, 189–194. Almeida, J., Mahon, B. Z., and Caramazza, A. (2010). The role of the dorsal cortical visual processing stream in tool identification. Psychol. Sci. 21, 772–778. Almeida, J., Mahon, B. Z., Nakayama, K., and Caramazza, A. (2008). Unconscious processing dissociates along categorical lines. Proc. Natl. Acad. Sci. U.S.A. 105, 15214–15218. Alpers, G. W., and Gerdes, B. M. (2007). Here is looking at you: emotional faces predominate in binocular rivalry. Emotion 7, 495–506. Amihai, I., Deouell, L., and Bentin, S. (2011). Conscious awareness is necessary for processing race and gender information from faces. Conscious. Cogn. 20, 269–279. Bahrami, B., Vetter, P., Spolaore, E., Pagano, S., Butterworth, B., and Rees, G. (2010). Unconscious numerical priming despite interocular suppression. Psychol. Sci. 21, 224–233. Blake, R., and Logothetis, N. (2002). Visual competition. Nat. Rev. Neurosci. 3, 1–11. Blake, R., O’Shea, R. P., and Mueller, T. J. (1992). Spatial zones of binocular rivalry in central and peripheral vision. Vis. Neurosci. 8, 469–478. Bruner, J. S. (1957). On perceptual readiness. Psychol. Rev. 64, 123–152. Cave, C. B., Blake, R., and McNamara, T. P. (1998). Binocular rivalry disrupts visual priming. Psychol. Sci. 9, 299–302. Cheesman, J., and Merikle, P. M. (1986). Distinguishing conscious from unconscious perceptual processes. Can. J. Psychol. 40, 343–367. Chen, Y., Norton, D., Ongur, D., and Heckers, S. (2008). Inefficient face detection in schizophrenia. Schizophr. Bull. 34, 367–374. Costello, P., Jiang, Y., Baartman, B., McGlennen, K., and He, S. (2009). Semantic and subword priming during binocular suppression. Conscious. Cogn. 18, 375–382. Dijksterhuis, A., and Aarts, H. (2003). On wildebeests and humans: the preferential detection of negative stimuli. Psychol. Sci. 14, 14–18. Draine, S. C., and Greenwald, A. G. (1998). Replicable unconscious semantic priming. J. Exp. Psychol. Gen. 127, 286–303. Engel, E. (1956). The role of content in binocular resolution. Am. J. Psychol. 69, 87–91. Erdelyi, M. H. (1986). Experimental indeterminacies in the dissociation paradigm. Behav. Brain Sci. 9, 30–31. Fang, F., and He, S. (2005). Cortical responses to invisible objects in the human dorsal and ventral pathways. Nat. Neurosci. 8, 1380–1385. Fox, R., and Herrmann, J. (1967). Stochastic properties of binocular alternations. Percept. Psychophys. 2, 432–436. Gaillard, R., Del Cul, A., Naccache, L., Vinckier, F., Cohen, L., and Dehaene, S. (2006). Nonconscious semantic processing of emotional words modulates conscious access. Proc. Natl. Acad. Sci. U.S.A. 103, 7524–7529. Garrido, L., Duchaine, B., and Nakayama, K. (2008). Face detection in normal and prosopagnosic individuals. J. Neuropsychol. 2, 119–140. Heathcote, A., Popiel, S. J., and Mewhort, D. J. K. (1991). Analysis of response time distributions: an example using the Stroop task. Psychol. Bull. 109, 340–347. Hesselmann, G., and Malach, R. (2011). The link between fMRI-BOLD activation and perceptual awareness is “stream-invariant” in the human visual system. Cereb. Cortex 21, 2829–2737. Hockley, W. E. (1984). Analysis of response time distributions in the study of cognitive processes. J. Exp. Psychol. Learn. Mem. Cogn. 10, 598–615. Jiang, Y., Costello, P., and He, S. (2007). Processing of invisible stimuli: advantage of upright faces and recognizable words in overcoming interocular suppression. Psychol. Sci. 18, 349–355. Jiang, Y., and He, S. (2006). Cortical responses to invisible faces: dissociating subsystems for facial-information processing. Curr. Biol. 16, 2023–2029. Kim, C. Y., and Blake, R. (2005). Psychophysical magic: rendering the visible “invisible.” Trends Cogn. Sci. (Regul. Ed.) 9, 381–388. Kim, Y. J., Grabowecky, M., and Suzuki, S. (2006). Stochastic resonance in binocular rivalry. Vision Res. 46, 39–406. Latinus, M., and Taylor, M. J. (2006). Face processing stages: impact of difficulty and the separation of effects. Brain Res. 1123, 179–187. Lewis, M. B., and Edmonds, A. J. (2003). Face detection: mapping human performance. Perception 32, 903–920. Lewis, M. B., and Edmonds, A. J. (2005). Searching for faces in scrambled scenes. Vis. Cogn. 12, 1309–1336. Lewis, M. B., and Ellis, H. D. (2003). How we detect a face: a survey of the psychological evidence. Int. J. Imaging Syst. Tech. 13, 3–7. Los, S. A. (1996). On the origin of mixing costs: exploring information processing in pure and mixed blocks of trials. Acta Psychol. (Amst). 94, 145–188. Mack, M. L., Wong, A. C. N., Gauthier, I., Tanaka, J. W., and Palmeri, T. J. (2009). Time course of visual object categorization: fastest does not necessarily mean first. Vision Res. 49, 1961–1968. Merikle, P. M., and Reingold, E. M. (1992). “Measuring unconscious perceptual processes,” in Perception Without Awareness: Cognitive, Clinical, and Social Perspectives, eds R. F. Bornstein and T. S. Pittman (New York: Guilford Press), 55–80. Miles, W. R. (1930). Ocular dominance in human adults. J. Gen. Psychol. 3, 412–420. Moradi, F., Koch, C., and Shimojo, S. (2005). Face adaptation depends on seeing the face. Neuron 45, 169–175. Mordkoff, J. T., and Yantis, S. (1991). An interactive model of divided attention. J. Exp. Psychol. Hum. Percept. Perform. 17, 520–538. Purcell, D. G., and Stewart, A. L. (1988). The face-detection effect: configuration enhances detection. Percept. Psychophys. 43, 355–366. Ratcliff, R. (1979). Group reaction time distributions and an analysis of distribution statistics. Psychol. Bull. 86, 446–461. Reingold, E. M., and Merikle, P. M. (1988). Using direct and indirect measures to study perception without awareness. Percept. Psychophys. 44, 563–575. Roseboom, W., and Arnold, D. H. (2011). Learning to reach for “invisible” input. Curr. Biol. 21, R493–R494. Rousselet, G. A., Macé, M. J. M., and Fabre-Thorpe, M. (2003). Is it an animal? Is it a human face? Fast processing in upright and inverted natural scenes. J. Vis. 3, 440–455. Seth, A. K., Dienes, Z., Cleeremans, A., Overgaard, M., and Pessoa, L. (2008). Measuring consciousness: relating behavioural and neurophysiological approaches. Trends Cogn. Sci (Regul. Ed.) 12, 314–321. Sheinberg, D. L., and Logothetis, N. K. (1997). The role of temporal cortical areas in perceptual organization. Proc. Natl. Acad. Sci. U.S.A. 94, 3408–3413. Shimaoka, D., and Kaneko, K. (2011). Dynamical systems modeling of continuous flash suppression. Vision Res. 51, 521–528. Sperling, G., and Dosher, B. A. (1986). “Strategy and optimization in human information processing,” in Handbook of Perception and Human Performance, Vol. 1, eds K. R. Boff, L. Kaufman, and J. P. Thomas (New York: Wiley), 2–65. Stein, T., Senju, A., Peelen, M. V., and Sterzer, P. (2011). Eye contact facilitates awareness of faces during interocular suppression. Cognition 119, 307–311. Stein, T., and Sterzer, P. (2011). High-level face shape adaptation depends on visual awareness: evidence from continuous flash suppression. J. Vis. 11, 5. Sterzer, P., Hilgenfeldt, T., Freudenberg, P., Bermpohl, F., and Adli, M. (2011). Access of emotional information to visual awareness in patients with major depressive disorder. Psychol. Med. 41, 1615–1624. Sterzer, P., Jalkanen, L., and Rees, G. (2009a). Electromagnetic responses to invisible face stimuli during binocular suppression. Neuroimage 46, 803–808. Sterzer, P., Kleinschmidt, A., and Rees, G. (2009b). The neural bases of multistable perception. Trends Cogn. Sci. (Regul. Ed.) 13, 310–318. Thomas, E. A. C., and Ross, B. H. (1980). On appropriate procedures for combining probability distributions within the same family. J. Math. Psychol. 21, 136–152. Tong, F., Nakayama, K., Vaughan, J. T., and Kanwisher, N. (1998). Binocular rivalry and visual awareness in human extrastriate cortex. Neuron 21, 753–759. Tottenham, N., Tanaka, J. W., Leon, A. C., McCarry, T., Nurse, M., Hare, T. A., Marcus, D. J., Westerlund, A., Casey, B. J., and Nelson, C. (2009). The NimStim set of facial expressions: judgments from untrained research participants. Psychiatry Res. 168, 242–249. Tsuchiya, N., Moradi, F., Felsen, C., Yamazaki, M., and Adolphs, R. (2009). Intact rapid detection of fearful faces in the absence of the amygdala. Nat. Neurosci. 12, 1224–1225. Tyler, C. W., and Chen, C. C. (2006). Spatial summation of face information. J. Vis. 6, 1117–1125. VanRullen, R. (2006). On second glance: still no high-level pop-out effect for faces. Vision Res. 46, 3017–3027. Walker, P. (1978). Binocular rivalry: central or peripheral selective processes? Psychol. Bull. 85, 376–389. Williams, M. A., Dang, S., and Kanwisher, N. G. (2007). Only some spatial patterns of fMRI response are read out in task performance. Nat. Neurosci. 10, 685–686. Williams, M. A., Morris, A. P., McGlone, F., Abbott, D. F., and Mattingley, J. B. (2004). Amygdala responses to fearful and happy facial expressions under conditions of binocular suppression. J. Neurosci. 24, 2898–2904. Yan, X., Jiang, Y., Wang, J., Deng, Y., He, S., and Weng, X. (2009). Preconscious attentional bias in cigarette smokers: a probe into awareness modulation on attentional bias. Addict. Biol. 14, 478–488. Yang, E., Hong, S.-W., and Blake, R. (2010). Adaptation aftereffects to facial expressions suppressed from visual awareness. J. Vis. 10, 24. Yang, E., Zald, D. H., and Blake, R. (2007). Fearful expressions gain preferential access to awareness during continuous flash suppression. Emotion 7, 882–886. Yang, Y., Rose, D., and Blake, R. (1992). On the variety of percepts associated with dichoptic viewing of dissimilar monocular stimuli. Perception 21, 47–62. Yang, Y. H., and Yeh, S. L. (2011). Accessing the meaning of invisible words. Conscious. Cogn. 20, 223–233. Yu, K., and Blake, R. (1992). Do recognizable figures enjoy an advantage in binocular rivalry? J. Exp. Psychol. Hum. Percept. Perform. 18, 1153–1173. Zhou, G., Zhang, L., Liu, J., Yang, J., and Qu, Z. (2010a). Specificity of face processing without visual awareness. Conscious. Cogn. 19, 408–412. Zhou, W., Jiang, Y., He, S., and Chen, D. (2010b). Olfaction modulates visual perception in binocular rivalry. Curr. Biol. 20, 1356–1358. Zimba, L. D., and Blake, R. (1983). Binocular rivalry and semantic processing: out of sight, out of mind. J. Exp. Psychol. Hum. Percept. Perform. 9, 807–815. Accepted: 30 November 2011; Published online: 20 December 2011. Copyright: © 2011 Stein, Hebart and Sterzer. This is an open-access article distributed under the terms of the Creative Commons Attribution Non Commercial License, which permits non-commercial use, distribution, and reproduction in other forums, provided the original authors and source are credited.